One of the questions I have been getting alot lately is, "Why are steam juicers not shown on your site?" So I thought I would take some time to write an in-depth article with comparison chart of the "fresh juicers" vs. the steam juicer. Juicers that make fresh juice are the type of juicers we choose to offer. They take fresh produce, and create fresh, enzyme rich, living juice. We choose to offer this type of juicer, since this juicer produces a "live" juice. A live juice contains the highest possible amount of Purified Water, Vitamins, Minerals, Enzymes, Phytochemicals including Antioxidants, Proteins, Carbohydrates, Fats, Fiber and Other Unknown Nutrients. We have had numerous customers report to us that by drinking fresh-made juice, they feel better, loose weight, have more energy and are overall healthier. We are all told that we should eat 5-9 servings of fruits and vegetables a day, and juicing is an excellent way to boost the amount of fruits and vegetables you consume. For the highest benefit, this juice should be consumed right after its made. If you did want to store the juice, you can read more about that here. Steam juicers on the other hand do not create "fresh and live" juice. They cook the juice. When the produce is heated, enzymes are lost and destruction of other nutrients in the juice occurs. Most canned or bottled juices purchased in the store have been heated so they are "shelf-stable" and are devoid of enzymes. This type of juice has lower nutrient quality than a fresh juice. It is said one of the main benefits of juicing is the enzymatic activity of the juice, which is lost when the juice is heated. Fresh juicers work by using mechanical means to break open the cell walls of the produce (such as shredding, grinding or pressing) which extracts the juice out of the produce. There are several types of mechincal juicers, such as centrifugal, centrifugal ejection, masticating, single auger, twin gear, and press style juicers. You can learn more about these type of juicers here. The majority of fruit and vegetable juicers work well on most fruits and vegetables, although challenges can occur when juicing some fruits. Please read more about that in this article. The steam juicer works by steaming the produce to cause the cell walls to break and causes the juice to fall into a juice kettle which is then drained into jars or bottles. Due to the heat and extraction method, this juice is concentrated. Steamed juice can be used to make concentrates, syrups, jams and jellies. Steam juicers can only juice certain soft fruits, such as: tomatoes, berries, grapes, cherries, apricots, rhubarb, peaches, pears, strawberries, raspberries, currents, and apples. Steam juicing was invented so that one could basically "can" the juices, after which no refrigeration is required, since the juice has been "sterilized" and contains no enzymes. 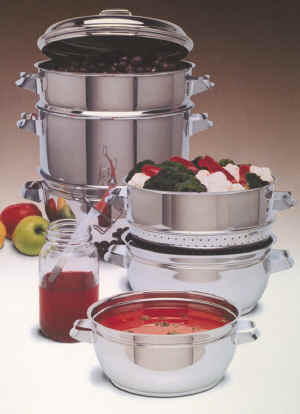 Steam juicers are often constructed out of Aluminum or Stainless Steel. If you did decided to purchase a steam juicer, I would recommend going with a Stainless Steel model as there can be problems with cooking in Aluminum. People have mentioned that "Alzheimer's" can be caused by eating and/or cooking with Aluminum. Lets do a comparison of the Steam Juicer and one of our favorite Fresh Fruit and Vegetable Juicers. We hope you have learned more about the two juicers featured in this comparison. The Steam juicer can have its benefit for some people that wish to preserve their soft produce in order to make juice concentrate, jams, jellies or syrups. For making juice, we feel its not optimal, since it destroys all the enzymes and leads to the destruction of other nutrients in the juice. Fresh juicers preserve all the enzymes, and keep most of the other nutrients intact, but must be consumed very soon after it is made.. Freeze soft fruits whole, that can later be thawed, and eaten whole, or placed into the blender to make fresh smoothies, or used as a topping on deserts, etc. Juice the produce in a fresh juicer, and then freeze the juice. Farmers that process apples into apple cider most often do this. They store the apple juice in plastic milk-style jugs, and freeze them. The sell them frozen, and when you want to drink them, you thaw and drink. You can read more about the best ways to store your juice here. Dehydration has been used for thousands of years to preserve produce. Purchase a dehydrator to dehydrate your fruits and vegetables preserving their enzyme content. We hope this article has taught you more about the difference between the steam juicer and a fresh fruit and vegetable juicer and have offered you some suggestions based on your needs.